Sanssouci, the summer palace of Prussian king Frederick the Great, is part of the world heritage site Palaces and Parks of Potsdam and Berlin and well known for its beautiful gardens. Our Australian readers will be happy to learn that the name Sanssouci roughly translates to “No worries”. Michael Kiesling, the famous German game designer, is part of the world boardgame heritage and well known for his long list of successful games, including Spiel des Jahres winners Tikal and Torres as well as the nominees Asara, The Palaces of Carrara and many more, equally successful games. His name, to the best of my knowledge, does not translate to anything. Putting those two together – Sanssouci and Michael Kiesling – should yield good things. 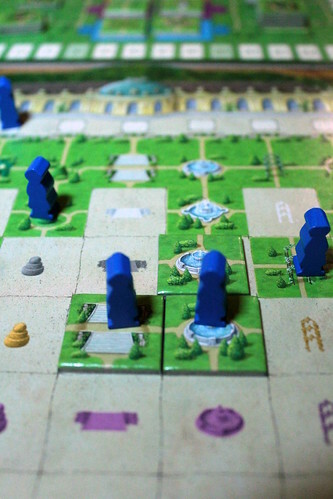 The game Sanssouci lets you ignore the whole palace part, it starts at the back door: in the gardens. It’s a game about the rarely used and peaceful subject of gardening. Your job is to build the gardens of Sanssouci in 18 turns, creating lines with 9 different types of garden ornaments like statues, fountains or mazes – not, however, the very German garden gnome. Each type of ornament goes in one column of your player tableau. Looking the other way, the player tableau has five rows with different colours and increasing point values from the top – closest to the palace – to the end of the garden at the bottom. Each turn, you only have ten ornaments to pick from for your garden. You get them in one piece, like a complete maze or a complete fountain, without messing around with individual hedges or other parts. Probably everything comes flatpacked, like Ikea furniture. The central game board that you pick your ornament tiles from has two spaces each in five colours. The same five colours as the rows on your private board. Experienced gamers will guess that this is not a coincidence. Now, when I said that you have ten tiles to pick from, I may have been a tad optimistic because your choice of ornaments at GardenMart is further restricted by your cards. You only have two hand cards of which you play one. Cards may show a type of ornament and allow you to take any tile of that type, or they may show two colours and let you take a tile lying on a space of one of those colours . Each player also gets one wild card, but only one. Fortunately for you, playing an ornament card that currently has no matching ornaments on offer also acts as a wildcard, but even so you will have many turns with only two to four ornaments that you can actually take. Once you have them, they have to go to your garden. Unsurprisingly, it has to go to the column for that type of ornament. But that’s not all, it also has to go to the row with the same colour as the space it came from. Eighteen turns, one tile per turn, you obviously won’t be able to fill up the 45 spaces your garden has. But that’s not necessary anyway, you’re not here to create a complete garden, or even a beautiful garden, your task is to give bored noblemeeples an opportunity to walk down the garden as far as they can. Being the fops they are, these guys don’t want their shiny shoes to get muddy and will only walk over the paths you create with your ornaments. The real goal of the game is to create paths for the nobility to stroll down the garden, ideally all the way to the last row. After you place a new ornament, you may move one noblemeeple down the garden. He has to end his stroll in his original column, but on the way there he may walk anywhere there is a path. 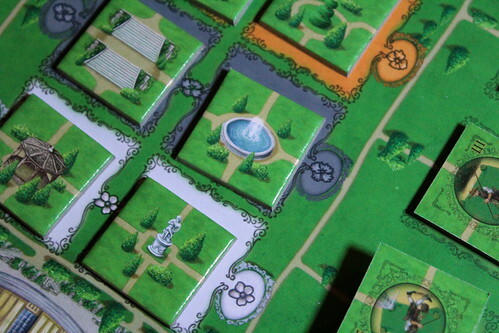 So you don’t have to fill your garden with pretty ornaments, if you can build a path all the way to the bottom and then spread out, that’s enough for your noblemeeples to have an enjoyable afternoon – and score points. But even that can be challenging since there is no guarantee that the tile you need will ever show up on the right colour. That’s where the gardeners become your best friends. If you take a tile that you can not place in your garden any more because that spot is already taken, you may turn it to its gardener side and place it anywhere in the same row or column as the original spot. 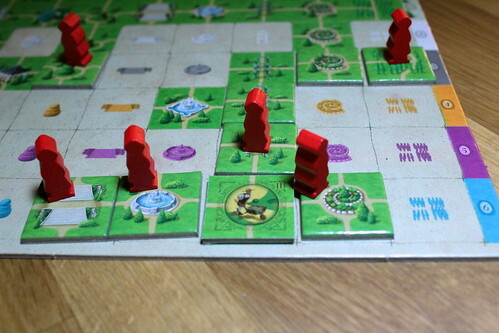 A noblemeeple can never stop on a gardener tile and score points – they can’t stand observing manual labour – but they can cross it to reach the beautiful, finished parts of the garden. Strategic use of gardeners is pretty much the key to Sanssouci. Each time you move a noblemeeple, he scores points. Doing that well scores nicely already, but it’s not the only way to gain points. Each player also has two mission cards, showing one type or ornament. The noblemeeples in those two columns will score again at the end of the game, giving an incentive to get those two guys to the end of the garden, even if it’s not the best move otherwise. You also score points for completed rows or columns and, when playing with the expert rules, may gain points or sometimes lose points for putting an ornament or a gardener on marked fields. The different scoring options create some tension in your strategy: working towards one goal will often stop you from achieving another. Between goal cards, hand cards and available tiles, it’s obvious that Sanssouci involves a lot of luck. For a gamer’s game, that would be a bad thing, but Sanssouci does not pretend to be one. From the not-too-difficult rules, the dash of luck and utterly peaceful theme it’s clear that Sanssouci is a family game. And if you look at it from that perspective, it’s a good one, too. Despite the luck involved, you still have to think and plan a little to get the big points. Nevertheless, there’s only so much to do on your turn, so turns are short, no one has to wait more than a minute or two, and the game as a whole is quick enough to finish, too. The one thing I miss in Sanssouci is more player interaction. Everyone is building their own garden, and while you could theoretically pick tiles your opponents need that’s rarely a real option: you’d have to have the right card at the right time, and then you’d still have to be lucky to actually have a use for that tile. It’s mostly not worth it. Nevertheless, Sanssouci is a very good family game that is easy to pick up, quick to play, and creates about equal chances for kids and adults playing together without being boring for either. No worries! Simple, abstract games can be so frustrating sometimes. You spend 10 turns, waiting for the right tile, and just after you decide it won’t come up and put something else in it’s place, it comes up. DO you know that feeling? No? Then you don’t know Take it easy.